…—… SOS continues Munro’s exploration of light and language and develops his fascination for Morse code and messaging. In this final year of his residency with the Rothschild Foundation, the viewer experiences this creative development in a large scale single installation. 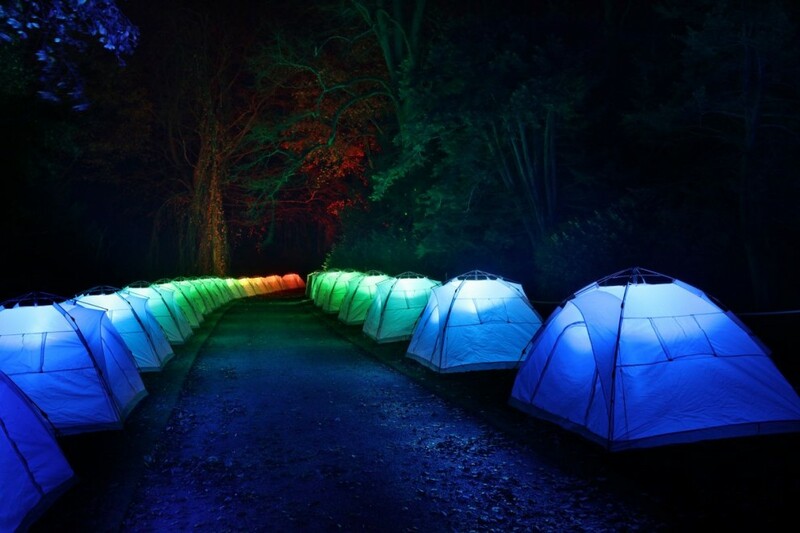 A pathway of tents stand sentry by day, transforming at night, illuminating the nocturnal landscape in an array of lights synchronized to the tuning of an old radio, snippets of sound and music emerging from a static fuzz. A shifting soundscape, pulses and streams of light through the installation are abruptly interrupted by the urgent Morse code international distress signal …—… SOS. Munro’s inspiration for this work derives from a love of camping, imagining tents as luminaire’s and old valve radios. The work is further inspired by an article he read in 2012 about the charity Shelterbox, an organisation who focus of providing first response relief and shelter to people caught in the midst of natural disaster and humanitarian crisis.